I’m pretty sure many people have this dream, but I’d love to own a couple of acres on a mountain with a tiny cabin where I can spend a few weeks each year. Who doesn’t love the idea of a little escape? However, my engineering brain begins to creep in and I start thinking about off the grid power. With the rise of the “prepper” movement, the term off-the-grid has taken on a little bit of a “tinfoil hat” connotation. I’m just fascinated with the idea of a solar/wind setup that can power many needs. However, as my electrical knowledge grows, I begin to understand more about the complexities of this dream. Do you go fully off the grid or have a hybrid system where the solar is a primary system, but you use power from a supplier for heavy loads? How do you decrease the loads to the very minimum, while still maintaining some modern comforts and amenities? Do you try and wire a structure entirely in DC, forcing you to buy expensive appliances and use an inverter only when necessary? There are commercially available charge control systems that prevent overcharge of batteries and reverse current, but I’ve been thinking of how one would actually design one of these. My skills are not there yet, but it’s fun to ruminate on what sort of problems I would need to solve with this. It is a little weird thinking of things with much larger power requirements than most electrical engineers are used to. I need to do quite a bit more research to learn some of the safety measures necessary. 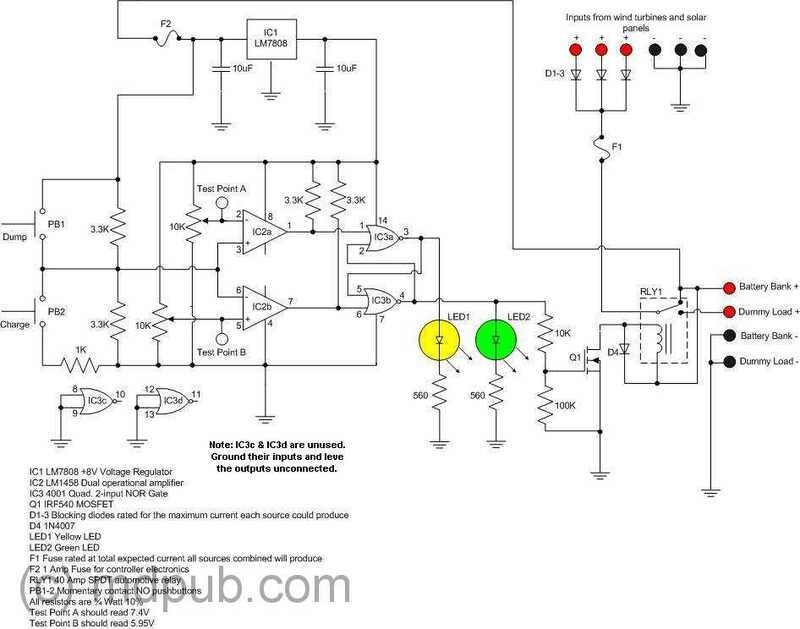 I found a few schematics on the internet for charge controllers. One by Mike over at mdpub.com uses MOSFETs and Op-Amps. Another solution he came up with was part of the 555 timer contest. Hopefully I’ll get to build one of these someday. Well, as of now, this is all a theoretical pipe dream because there’s this little problem of buying land, a structure, and thousands of dollars of solar panels and equipment. It’s fun to think about though! Well, if you’re in the mountains you wouldn’t need A/C… and you probably wouldn’t be there in winter and need anything other than a fire to keep warm… and would you really need to stay awake (and therefore need light) when it’s dark? What about propane and oodles of matches with which to cook? You wouldn’t have cell reception so you don’t need to charge your mobile device. So what do you need power for other than to charge an entertainment device like a computer? 😛 I guess maybe an emergency radio… Sounds to me like solar/wind/batteries. Also, is husband okay with you living by yourself in a remote area for a few weeks?